The Samsung Galaxy S6, which at the moment is the smartphone with the highest raw performance, is more than five times as powerful as the PlayStation 2s, released in 2000. 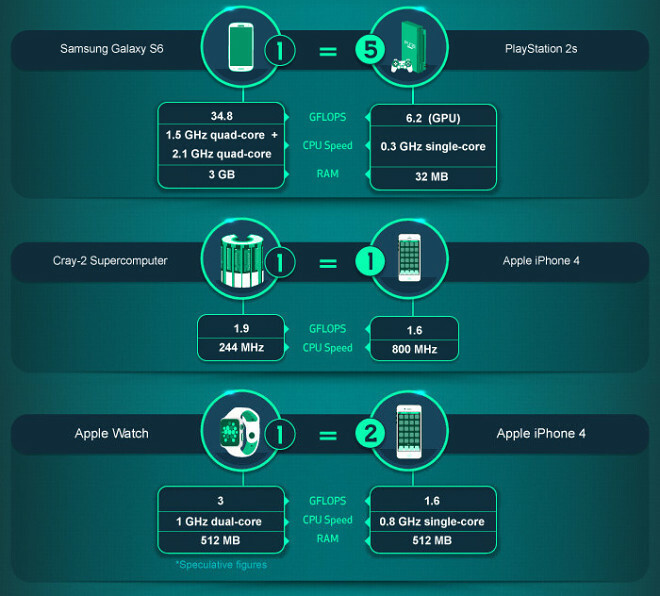 More impressively though, the 138g phone’s 34.8 GFLOPS are 2,900,000 times as much as the 12,000 FLOPS the IBM 704 room-sized supercomputer could produce back in 1954. Meanwhile, the aging Apple iPhone 4 is only slightly underpowered, compared to the Cray-2 supercomputer, commissioned 25 years before it, in 1985. And then comes the Apple Watch, which puts twice as much processing power on your wrist.